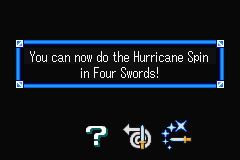 From "Four Swords" to "A Link to the Past"
To unlock the Riddle Quest in A Link to the Past you must obtain 10 Triforce Medallions in Four Swords. You must beat Vaati at least once in Four Swords in order to be considered "a true hero" and be allowed into this dungeon in A Link to the Past. 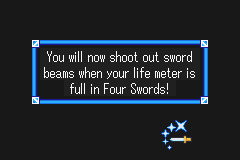 From "A Link to the Past" to "Four Swords"
Simply retrieve the Master Sword in A Link to the Past to unlock Sword Beams in Four Swords. Complete the Riddle Quest in A Link to the Past. This move will then be available in both games. This page was last edited on 27 March 2014, at 16:36.